Projection seems to be growing in popularity as a protest tool, whether it’s due to a lack of legal legislation surrounding its use or its ephemeral nature. We have already seen Holograms for Freedom, the world’s first hologram march in protest of Spain’s new ‘gag’ laws. 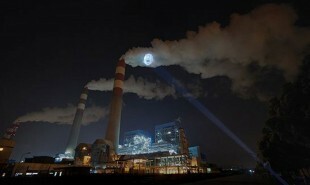 Now, Chinese company Xiao Zhu is projecting images of suffering children onto toxic smoke as a protest against commercial pollution. China is thought to have more than 500,000 people die every year from various diseases caused by air pollution. Xiao Zhu, a company selling air purifiers, is highlighting the dangers of this through its Breathe Again ad campaign. The installation is comprised of a series of arresting images of youngsters — crying and coughing — projected ominously onto factory plant pollution, accompanied by the text ‘Clear the air, let the future breathe again’. By directly targeting the biggest culprits of environmental damage and using actual pollution as a medium, the company effectively conveys the message of promoting sustainable businesses and clean air. How could techniques such as projection be used beyond marketing and awareness campaigns? Perhaps a similar system — projecting onto murky air — be used to for fog warnings?